Open source Stackoverflow & Quora alternative. 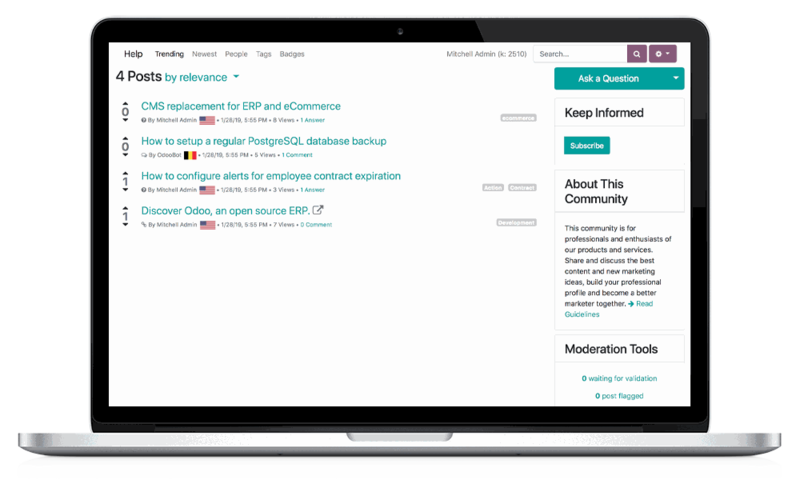 What can you do with Odoo Forum? Discussions are indexed and findable through search engines. Rank for more keywords and improve your SEO with fresh content created by your community everyday. Search engines like Google are always rewarding websites that provide unique and regular content. Keep track of your customers’ needs and wishes by analysing the hottest, most viewed and most shared topics. The forum is integrated with Google Analytics to help you keep track of likes and shares - even outside of your website. Turn the best answers into official documentation in just one click with the ‘Promote to documentation’ tool. Better than a helpline or a FAQ section, a forum will allow your customers to ask questions and find answers quickly, without wasting time on the phone, saving you money! It’s the most powerful database you can find. Your employees and your whole community will take part! Grant badges to your members for their questions, answers, shares, likes and votes to reward the most active ones. Set up a moderation system with Karma points to give your most active members access to more functionalities and to reduce spamming messages. Design efficient emails campaigns Send, convert and track your success. Attract more leads with a winning content marketing strategy. Create sleek and attractive event pages. Sell online and organize on site. Engage directly with your website visitors to attract leads and boost online sales.